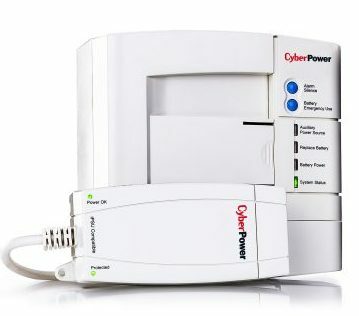 Designed for interior use, the CyberPower CS36A12V3-T Indoor CyberShield™ FTTx System supplies continuous 12 VDC to local power network interface devices (NID), cable telephone modems, wireless base stations, fiber to the home (FTTH), optical network terminals (ONT), and integrated access devices. 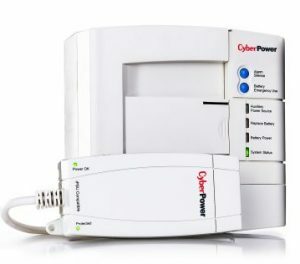 The CS36A12V2 provides a bundled package of a power supply model (CS50A48V2) and a battery backup model (CS36D12V). The CA50A48V2 (AC/DC 48VDC) power supply model is located inside the subscriber’s home and plugs into a 110/120 VAC outlet to transform power to 48VDC, which is then fed through a power cord to the battery backup model (CS36D12V). The battery backup model feeds 12 VDC to the ONT/NID. Features of the CS36A12V3-T bundle package include high-function design, battery emergency functionality, audible alarm signals with silence options, microprocessor intelligent control, a telemetry interface, optional extendable runtime, and LED indicators. It also comes with a three-year warranty. Battery Emergency Use Button – Allows use of emergency battery reserve, or power to the load after installation of new batteries. Audible Alarms – Signal conditions that may affect operation: On Battery, Low Battery, and Replace Battery. Alarm Silence Button – Silences the audible alarm during extended outages.